Not too long ago RWC-follower, Kim (“from Milwaukee”) pointed me in the direction of a fascinating segment of the TV program “Dirty Jobs”, involving the host working on a worm farm in Florida (see the comments section of “John’s Passive Worm Harvester“). Specifically, there was a bit about them adding slices of white bread on top of their beds as a means of drawing loads of worms up to the surface that had caught her attention. Unfortunately the episode has since been removed from YouTube (I had assumed that it was an actual Discovery Channel upload – but I guess not), so you won’t likely be able to find it online anymore. Anyway, seeing this clip definitely made me want to do small trials with slices of bread (or something similar) in some of my own systems. I’ve never thought of bread as being a “great” worm food. Starchy foods in general always end up on my “use with caution” list since they tend to turn into blobs of anaerobic goo when buried in a worm bin (especially if you add a lot at once). The idea of top-feeding with bread definitely seems like more of an intriguing idea, however. This way it’s much more likely that conditions will remain aerobic, and that the bread won’t end up turning into a wet sloppy mess. There IS of course the potential for some (serious) mold growth – but I guess we’ll have to wait and see! Like my “pineapple vermicomposting” trials, this is a very basic little experiment. All I did was place two halves of a hamburger bun, face-down, in each of the same two bins used for the pineapple project (a plastic enclosed Euro bin, and my VB48), then cover them lightly with some bedding. This was done on Friday (or “a few days ago” for those of you reading this at some later time). Since then I have been monitoring the situation to see what sorts of critters (if any) are attracted to the bread. Interestingly enough, in the VB48, I DID find some worms congregated underneath one of the bun halves the next day – but since then it seems to have become more of a springtail party (along with quite a few white mites in the case of the VB48). My hunch is that the other critters (likely including isopods in the VB48) will do most of the initial bread-munching, and that the worms will appear for clean up duty a bit later on. But we shall see! In the meantime I’ll continue to monitor the situation (and take pictures). Hi Bentley. So far what you’re reporting is exactly what I’ve seen my self when adding scraps of uneaten bread crust. I just left it on top and the springtails and mites had a party. Disappeared pretty quick, but I didn’t dig under to see if worms were there. I’ve seen the same with springtails and mites but did find tons of worms under the slice of bread. I also found that wetting the bread seemed to make it dissappear a lot faster than the dry slice!!! All kidding aside, I have been getting lazier and lazier about what I put in the VB24. It gets some bread, citris, onions and other no-nos (still avoiding meat, I ain’t crazy) on a regular basis, but still in moderation, and the kids still seem to be doing fine. Aw Bentley, you tickled me mentioning my name! What a fun experiment! I wonder if using the bread in an ‘open air’ bin like in the Dirty Jobs program makes a difference. I think that was the biggest surprise for me when I saw it, that they didn’t cover the bins, just left them wide open (although under a roof). It kind of went against all we’ve been taught about worm bins…cover, cover, cover! Springtails seems to love moisture, they always show up when they are enclosed in a bin. On another note…I never have any meat to go into my compost bin….it always ends up in soup. Or my sister’s dog’s mouth. When I need to concentrate worms in a bunch I have found that an over ripe Avocado cut in half placed cut side down will do it fast.3 or 4 days the consumed pulp will be replace with a blob of worms.A hallowed out watermelon skin works too but not like an Avocado. I’ve also found that if you keep the bread wet, it can get yeasty, it’s eaten faster, and doesn’t mold. If however it dries out, it’s mold and takes much longer as the worms don’t eat it. 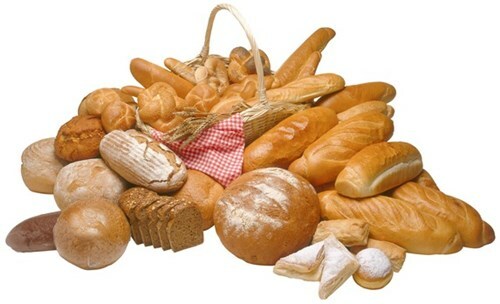 Makes sense as worms like bacteria, and mold and bacteria are competing for food (the bread). So if you have a ton of mold, could very well not have that much bacteria. It’s why a mold like penicillium would evolve to give off penicillin in the first place (to kill off bacteria). Bacteria is generally first, but if mold can get access they take over after a time. some suprising science, more complex than you expect. I have no garden now but have a outside yard/ bin made of waggon pallets. about 4ftX4ft X hight about 5ft. Sure you know what i mean. filled it up with dry leaf from the park and placed all my mashed up food scraps each week on top ( food waste/brown cardboard ) about 50/50 all blended up to a pulp. I also asked my neightbours and they give me there scraps. i said no meat only veg and egg boxes but a bit of bread is allowed and that was 2 years ago. I have not disturbed the heap in 2 years now, this being the 3rd.I age the pulp for 2 weeks or more, but find that one of my friends tends to put a lot of bread in. In my aging box ( green reuse bin from council or rubber maid to others ) i tend to get a lot of white mould after 3 days with the bread mix, but i have never found it a problem. the worms love the mix. about 3/5 veg and 2/5 card board with bread (more card board than bread) and i have never had a problem. Remember it is all pulped and just pours out of my bucket as slop, on top of the leaf mould. It does attract slugs but that is life. I now have about 1 ft black soil ( worm cast i hope) and about 6 in leaf litter compressed. with my slop on top. This will continue for years if i let it. What i want is some compost to use in a large hand built container out the front of my house( think front of your house ) its long! and i need at leased 9in deep. How long do i have to continue before/or after feeding the bin before i can call it compost and not worm cast??? will it be too rich. remember this is the only supply of worms i have and i have no top soil to mix with. Will it be too rich next spring if i stop feeding it, now? Will it ever be good to use instead of soil? How long can i leave it? Oneman, I’ve used my compost from my bin exclusively for gardening without adding soil and it works great. As long as it looks dark and you can’t distinguish any food particles in it anymore it should be fine. Smell it, it should smell like soil. I take mine from the bottom, the stuff that is finished. The 1 ft of dark matter (cast)at the bottom from last year is great and i will never have any problem with food scraps as it is all pulped to sludge before it goes in on top. The worms eat it too fast to cause any smell the only problem is, I have a outdoor bin and it rains in England, don’t ya know!!! it has never dried out in the time i have been here. Missed the episode. However my worms don’t care as much for bread as much as they do other things i put in there. I used to compost several whole loaves of bread at once in my open big bins. 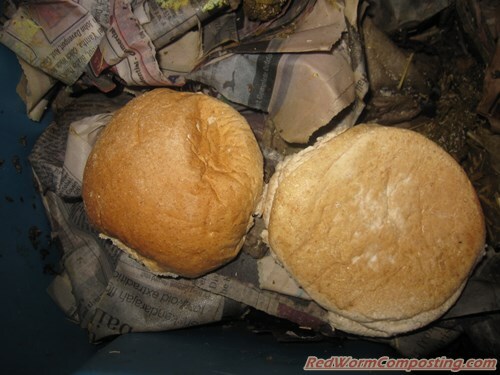 Then one day my wife went in my worm tent and almost passed out from the bread mold. She will no longer go in my worm tent after that. If you got an allergy to penicillin or certain molds you might want to use extreme caution. Moldy bread shoots spores all over the place on top of a bin. I tend to never bury bread. I still think it will be too strong to use neat. The question is, if i remove the worms how long will the remainder cast/ compost be good? I know it will always be good but it there a time limit for its goodness?? with the microbes??? Just don’t let it dry out and you should be fine. I would leave it in the bin if you can, so the microbes can continue to feed. Try doughy white bread…like a McDonalds Hamburger Bun. It’s a favorite. PAUL – Interesting – thanks for sharing! ANDREW – Good idea. Will definitely test that out. PHIL – I’m just getting warmed up here! I think it will be fun to test out a wide range of materials and see how they compare with one another. KIM – thanks again for helping to get all this started! My VB48 is basically an open bin (no lid on it at the moment) – but I think there are a variety of factors at work here. The type of bread (as Jerry points out further down) likely makes a difference (pretty sure it was white “WonderBread” or something similar in the video) and the ecosystem/habitat present. I wouldn’t be surprised if the worms were much more interested in a bin where the habitat was a lot more uniform and where there were far fewer of the other critters (likely the case in a pro vermicomposting bed like the one in the vid. PETER – that show sounds interesting! I’ll have to check it out. Thanks! These worms feed on fungi (and other microbes) as well – but you are right about situations where the mold takes over like that. If it gets to the point where there are fruiting bodies (which I think technically is when a fungi would be called a mold in the first place), the worms definitely don’t seem nearly as interested. ONEMAN – Looks like Kim did a good job helping you out (thanks Kim)! LARRY – Wow – several loaves at once? That’s a scary thought! Can only imagine what sort of spore cloud you’d get from that. Good advice about being careful with moldy stuff – I feel the same way. Actually looks like the buns are molding in one of the bins, so I may call it a day for this particular trial (going to try some other breads etc though), and just bury the buns. JERRY – Yep, that’s what I need to try next! It was definitely some sort of white bread in the video. I bet a moistened WonderBread slice will be more appealing to them. If you can. Soak the bread in water and blend with paper towels and see what happens. I started mixing it with other stuff and you don’t seem to notice the mold. Kind of sounds like another experiment brewing here somewhere. Lol! You inspired me to try this myself. Two slices of bread–one white, one whole grain–right on top and soaked with water. I’ve never seen such activity in my bin…veritable worm swarms that devoured the bread completely and in short order. The slices looked as if they were undulating for all the motion beneath them. Cool. Just saw the comment from Matt on cardboard tubes so i responded to that first. I am about to start a experiment with 50/50 tubes and bread only. I will add a hand full of river sand/grit to keep their digestion happy. The plan is. To use a rubbermaid or recycle bin as it is called over here. It is going to take time to start the bins off as i do not have much in the way of cardboard and lots of old bread. I will keep both bread and cardboard tubes bits in separate containers out side to age ( this is just because i do not have enough to fill two bins in one go) Bread is plenty and i am short of cardboard to fill two bins. The progressive outdoor aging process, can only be a bonus and i do expect lots of mold with both bins. Hopefully in two weeks i can mix them 50/50 and put them in side my garage. Remember i am starting now with bread and cardboard tubes, in two outdoor bins separate and adding every day as i find bread and cardboard. Hopefully i should have two bins of aged bedding and food to use and test in a few weeks. I will let you know. There is one other thing. I have been trying hand blenders to mix my cardboard and kitchen waste with rain water for about 3 years now as this is the best worm food (blended so that it is small to eat) and have found that most of the hand blenders will not get past the 2 min stage on turbo!!! without blowing up and doing the job. I use a one gallon bucket half filled with scraps/cardboard and fill it up with rain water and leave it outside to age while topping up, when i can each day. covered with 1 inch of water. This is my guide in the bucket. Only about 1/2 full with 1 inch of rain water to cover. What i would like to ask of you Bentley is can we have a blog to discuss the best and worst hand blenders? Is that possible. we know this is the best way to feed our worms. Hope we can have a new blog to discuss this and rate and review them as industrial mixers are out of the ££££££ question. I live near cummings ( great cardboard shredder from other post on here earlier) but it looks like a really old but of kit. I only live 5 mins away so might take a photo copy of it and ask them about it. Never know ? they could have a back room of spares!!! Kind regards and good luck.Hope you have a perfect week.